Flexicon has introduced a TIP-TITE drum dumper that is designed for use with poorly-flowing or agglomerated materials, allowing rapid transfer of free- and non-free-flowing bulk solid materials dust-free. Similar in performance to open chute dumpers but with total dust containment, the outlet on the downstream end of the dumper is nearly equal in area to that of the drum opening, allowing agglomerated materials and large chunks to be discharged with minimal possibility of material bridging. Drums from 30 to 55 gal (114 to 208 litres) are positioned on the dumper platform, which is raised by a hydraulic cylinder, seating the rim against the circular end of the discharge transition. A second hydraulic cylinder tips the platform-hood assembly and drum, stopping at dump angles of 45, 60 or 90 degrees with a motion-dampening feature. At full rotation, the transition outlet mates with the gasketed square inlet on the lid of a hopper or downstream process equipment, allowing a pneumatically-actuated slide gate valve to be opened and closed for total or partial discharge with no dusting. The stainless steel transition can be supplied with a square or rectangular outlet as shown, as well as with circular outlets, with corresponding gasketed flanges for installation on downstream hoppers and receiving vessels. Non-product-contact materials of construction can be specified in carbon steel with durable industrial finishes, or stainless steel finished to industrial or sanitary standards. 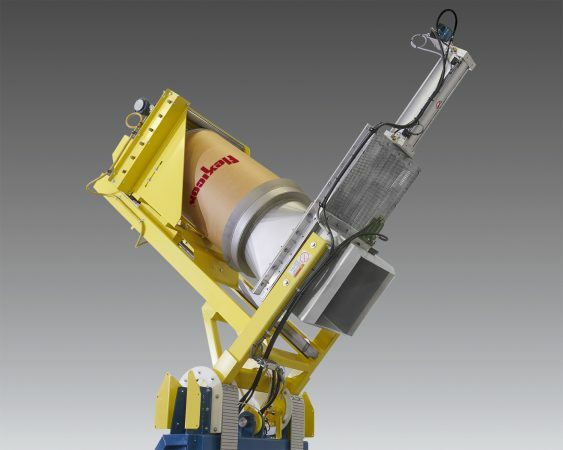 The company also manufactures manual bag dump stations, bulk bag dischargers, bulk bag conditioners, bulk bag fillers, flexible screw conveyors, tubular cable conveyors, pneumatic conveying systems, weigh batching and blending systems, and engineered plant-wide bulk handling systems with automated controls.